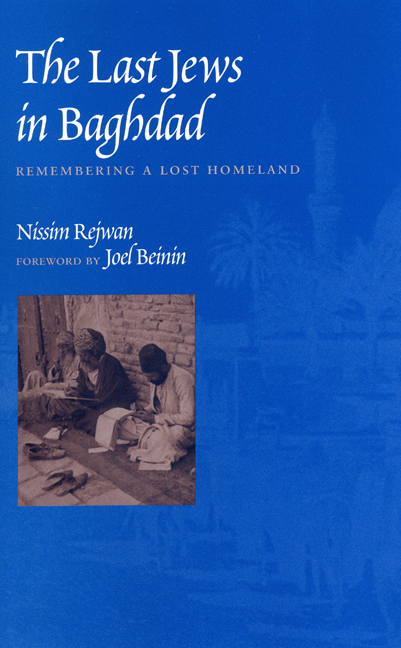 In this beautifully written memoir, Nissim Rejwan recalls the lost Jewish community of Baghdad, in which he was a child and young man from the 1920s through 1951. Once upon a time, Baghdad was home to a flourishing Jewish community. More than a third of the city's people were Jews, and Jewish customs and holidays helped set the pattern of Baghdad's cultural and commercial life. On the city's streets and in the bazaars, Jews, Muslims, and Christians—all native-born Iraqis—intermingled, speaking virtually the same colloquial Arabic and sharing a common sense of national identity. And then, almost overnight it seemed, the state of Israel was born, and lines were drawn between Jews and Arabs. Over the next couple of years, nearly the entire Jewish population of Baghdad fled their Iraqi homeland, never to return. In this beautifully written memoir, Nissim Rejwan recalls the lost Jewish community of Baghdad, in which he was a child and young man from the 1920s through 1951. He paints a minutely detailed picture of growing up in a barely middle-class family, dealing with a motley assortment of neighbors and landlords, struggling through the local schools, and finally discovering the pleasures of self-education and sexual awakening. Rejwan intertwines his personal story with the story of the cultural renaissance that was flowering in Baghdad during the years of his young manhood, describing how his work as a bookshop manager and a staff writer for the Iraq Times brought him friendships with many of the country's leading intellectual and literary figures. He rounds off his story by remembering how the political and cultural upheavals that accompanied the founding of Israel, as well as broad hints sent back by the first arrivals in the new state, left him with a deep ambivalence as he bid a last farewell to a homeland that had become hostile to its native Jews. Nissim Rejwan is currently a Research Fellow at the Harry S .Truman Research Institute for the Advancement of Peace at the Hebrew University in Jerusalem. Over a distinguished, six-decade career as a historian and journalist, he has published a dozen books, including The Jews of Iraq: 3000 Years of History and Culture and Israel's Place in the Middle East: A Pluralist Perspective, for which he won the 1998 National Jewish Book Award for Israel Studies. It has often been said that New York is a Jewish city. I think one can safely say the same about Baghdad of the first half of the twentieth century. At the time of writing, barely a hundred Jews, most of them elderly, live in my hometown. The one monument these Jews have left is a synagogue where, as their ancestors did from time immemorial, they keep praying for "the welfare of the city," as Jews in the Babylonian diaspora were bidden to do by the Prophet Jeremiah some three millennia ago. For those who, like myself, were born, grew up, and lived in Baghdad in the years preceding the mass exodus of Jews from Iraq in 1950-1951, this state of affairs is extremely hard to imagine. In 1904, the French vice-consul in Baghdad gave the number of Jews in the then Ottoman vilayet as forty thousand, out of a total population of sixty thousand. In 1910, a British consular report estimated the number of Jews in Baghdad as ranging from forty-five thousand to fifty thousand. In October 1921, a British publication quoted these population figures for the city as given in the last official yearbook of the vilayet: Total number of inhabitants, 202,200, of whom 80,000 were Jews; 12,000 Christians; 8,000 Kurds; 800 Persians; and 101,400 Arabs, Turks, and other Muslims. A proclamation issued by the British military governor early in 1919 fixed the number of sheep to be slaughtered daily in Baghdad East (al-Risafa, the more populous half of the city) at 220 for Jewish butchers and 160 for Muslim and other butchers. In 1926, the year the Baghdad Chamber of Commerce was founded, five of its Administrative Council's fourteen members were Jews, four Muslims, three represented British merchants, one each represented the banks, and one representing the Persian merchants. This was the Baghdad in which I first saw the light of day, and in which I spent the first twenty-six years of my life. However, while demographically the picture did not change in any significant sense up to 1951, a number of basic changes took place in almost all other aspects of the city's life throughout those three decades. One such aspect was especially pronounced—the Jewish religious scene. The community, and the family, into which I was born can be described as observant in the strictest sense of the word, though perhaps not "orthodox" in the sense in which European Jews in general and East European Jews in particular use the term. Up to the age of ten I used to take my father, who had lost his sight many years before, to the synagogue every Saturday morning, on Holy Days, and on the various feasts. On Friday evening, Sabbath candles were lit, the table set, the kiddush recited, and the esheth hayil chanted in unison by all the males of the family. Saturday mornings, after the service, I used to run to the neighborhood Muslim teashop with an empty pot to get, for free, boiling water for the tea that was such an indispensable part of breakfast. No money was seen and no deals struck. A rich and well-off class, mainly merchants and bankers, 5 percent. A middle class consisting of petty traders, employees, etc., 30 percent. A poor class, 60 percent. Beggars (hailing mostly from the north), 5 percent. If one follows this somewhat arbitrary classification, my family can safely be said to have belonged somewhere between the 30 percent of the middle class and the 60 percent poor, with periodic shifts between the two, mostly in the latter's direction. The world outside the home was brought to a virtual standstill on Saturdays and on Jewish holidays. The bazaars were practically empty, and all commercial activity in the city's main street ceased, with only a few scattered shops open. Not only did the Jews, who owned the overwhelming majority of shops and stores, close their business premises and refrain from doing any shopping themselves; non-Jews too followed suit, refusing to make purchases on Jewish holidays lest the owners of the few shops open take advantage of the situation and overcharge them for the goods they bought. There were also many cases of non-Jewish shop owners closing on these days for lack of customers. This was the position so far as the large bazaars and the main street were concerned. In those neighborhoods in which Jews predominated numerically—although no single neighborhood was ever exclusively Jewish—business life tended to come to a total standstill, what with non-Jews closing their shops, peddlers refraining from business, and petty farmers staying home rather than bring their fresh fruit and vegetables to bazaars where no "serious" buyers were to be found. These farmers, incidentally, used to bring their best and choicest produce to town on Fridays and on the eves of Jewish feasts, taking due note in fixing their prices of the seasonal needs of the Jewish inhabitants on these holidays—as, for instance, on the few days preceding the Feast of Tabernacles (Succoth) and Rosh Hashanah (the Jewish New Year) when certain fruits and vegetables were essential for the berakhot. An idea of the extent to which the role the Jews played in Iraq's commercial activity and in the Iraqi economy was dominant can be had from the fact that, in 1935-1936, nine out of the total of eighteen members of the Administrative Committee of the Baghdad Chamber of Commerce were Jews. So dominant was this role, indeed, that Jewish holidays affected even some socioreligious aspects of the daily life and mercantile activity of the Shi`is in Baghdad and the adjoining Shi`i townlet of Kazimayn, and this despite the fact that the Shi`is were notorious for boycotting Jews to the point of considering them untouchables. In his book, The Shi`is of Iraq , Yitzhak Nakash cites the following traveler's report: "Visiting Kazimayn in 1934-1935, the Lebanese Shi`i mujtahid (scholar) Muhsin al-Amin noted the practice of the Shi`i merchants of Baghdad of visiting the shrines of the imams in Kazimayn on a Saturday instead of a Friday, although Friday, as the Muslims' official as well as religious day of rest was the preferable day for the weekly visitation of the shrine. He explained that the business activity of the Shi`i merchants depended on the service of the Jewish merchants and brokers who dominated Baghdad's trade; hence, like the Jewish merchants, the Shi`is had to take their weekly day off on Saturday." Ten years later, when I was in my late teens, much was to change in Iraqi Jewish religious life and practices—as did so many other things. Indeed, the capacity of human beings to change and to adapt, taking things in their stride as if change, drastic change, was the most natural thing in the world, is something that has always made me wonder. The difference between the kind of world in which I was born in Baghdad of the mid-1920s and that in which I attained my maturity, in the late 1940s—not to mention the world in which we live now—was so great it would strain the imagination just to try to grasp it or to account for it. In my own case, it is true, the change may have been all the greater since I happened to have changed my habitat somewhere in mid-life, moving as I did from one country to another, from one culture to another. To be sure, in certain crucial cases the differences between the two societies was not all that shattering; but the change in the sheer pace of life and activity was considerable enough to make a big difference. The fact, however, is that in Iraq as well as in Israel, the two countries where my first fifty-three years were fairly equally divided, things did happen during these six decades—enormous, unsettling things that have changed the face of society; social and cultural changes of the most significant and crucial nature have taken place. The result was doubly unsettling: By the time I was twenty-five Iraqi society as a whole and the socioeconomic structure of Iraq's Jewish community had changed almost unrecognizably, while moving to Israel meant something of a "culture shock." During the past fifty years, moreover, Israeli society itself has undergone a number of radical changes, which, of course, have had their impact. In the house in Abu Shibil in which we lived as subtenants a tap was installed by virtue of the fact that it had a well that also served as a ritual bath, and the services of the saqqa were needed only when some technical mishap intervened and the house was left without clean drinking water, something which happened not infrequently. I remember vividly the neighborhood saqqa peddling his wares—a man with a heavily weighed donkey usually carrying three or four whole sheepskins brimming with water. The skins were especially made and adapted to contain the water so that only little of it gets lost in the inevitable drips, and the saqqa always knew where he was taking his donkey; he had regular clients with standing orders and usually refused to sell the water to other households. Whether drawn from taps or brought by the saqqa directly from the banks of the bountiful River Tigris, which ran right in the middle of the city dividing it into its two parts—Al-Risafa to the east of the river and Al-Karkh to its west—there remained the problem of where to keep the water clean and relatively cool. This was the easier part. On its arrival, the precious liquid was poured directly into a huge earthenware container usually standing in a prominent place in the inner courtyard. The hib—that is how it was called in colloquial Iraqi Arabic—was a center of attention and of a significance second only to that of the kitchen. Placed strategically in the shade, it was always carefully covered with a wooden top to keep away flies, mosquitoes, and other natural intruders from the air. The hib was a many-faceted device. Apart from keeping the water clean and fit for drinking it also served as a kind of primitive refrigerator. The water was always cool thanks to the breeze which, no matter how burning hot it was itself, always managed to cool the outside of the hib by contact with its damp walls. Moreover the hib, which was rounded and with a very narrow base, was placed on a sturdy wooden "cage" with small holes that, while permitting the draught to circulate inside and out, kept the place out of reach of scorpions, cockroaches, snakes, and certain other intruders from land. It was in this "cage," qafas, that some of the most valuable necessities were tucked away. Besides the special jug that was placed right under the hib's base to gather the water dripping therefrom, there was ample space in it to accommodate pots, bottles, and plates containing cooked meals, milk, yogurt, liquid medications, and fruit and vegetables, which were preserved in reasonable coolness through the sweltering heat of summer and kept out of harm's reach. The qafas also prevented the cats from reaching the meats and the milk products. Ice and ice boxes were introduced only in the 1930s and were used in the better-off households to preserve meats, vegetables, and fruits. It was rare in those days for a house in Baghdad to be free of scorpions and snakes, and in many households it was customary for the head of the family to go to bed only after he had inspected the holes in the walls for snakes. Although destroying scorpions was a duty, killing or harming a snake was strictly forbidden. Usually ground dry leaves of the nice-smelling butnaj were spread on the floor in the belief that snakes cannot stand the smell and consequently refrain from intruding any further. In certain households, again, the mistress of the house left a plate of milk around so that a snake drinking it would become pacified and friendly to members of the household. In such cases the mother chants, "O snake of the house, do not do us harm and we won't harm you!" One day when I was about four of age, the head of some little snake somehow came out of one of the holes in a wall in the inner house. Panic reigned; no one dared either to push the snake inside or bring it out. In the end, a certain "professional," a Muslim living in the neighborhood, was brought to the scene. Upon seeing the snake, he asked for an empty bottle, and with his bare fingers he extracted the snake out, its mouth tightly shut, straightened it, and deftly put it in the bottle, tail first. He then corked the bottle carefully, put it in his pocket, said salam, and went. No money was involved; the snake itself was apparently ample reward. Almost next in importance to getting and preserving water was the problem of the disposal of wastewater and sewage. Central sewerage systems were totally unknown and unheard of; domestic wastewater usually went into drains, of which there were always more than one in the house, dug deep somewhere right in the middle of the inner courtyard. There was also a separate hole in the ground directly linked to the toilet, which used to be a kind of glorified latrine. Toilet paper was not known since the Jews, following the custom of their Muslim neighbors, used water to clean themselves, for which end a special bottle was left in the toilet. Not only a Jew cannot ever be a night watchman; for some reason the night watchman roaming the alleys of Baghdad were invariably Muslims. It seems though that some of these failed to do their job properly, if not worse. In the late 1920s, in fact, the authorities discovered that a number of thefts that took place in certain neighborhoods were actually made possible by some secret understanding between the tcharkhatchis and the contractors who supplied them to the authorities. The result was that the work was eventually entrusted to paswaniyya (sentries) who received their pay from the Treasury. They also had to get their rifles every evening and return them the following morning, seemingly to prevent them from using the weapons for other purposes. It is interesting to note here, in parentheses, that in Iraq—and presumably in other parts of the Arabic-speaking world—in those days the appellation Arab was never used to define a person's identity, and the Jew-Arab opposition we constantly encounter today was never used either in writing or in daily discourse. A Baghdadian was usually said to be a Jew, a Muslim, a Kurd, a Christian, Armenian, Turk, Persian. An explanation for this is not hard to seek, I think. The so-called "national" identity of a man or a woman was not only of no relevance but the concept itself was not known, and in those cases in which you needed to know a person's identity in the wider sense of citizenship or geographical location you simply said he or she was a Syrian, an Egyptian, a Yemenite, an Iraqi, Palestinian, Turk, Persian, English—or, as in the case of our nazzah, Talkeifi. The day the nazzahs came—and they used to work in pairs or threes so that they could finish the work as quickly and as "cleanly" as possible—was a memorable one for us children. Depending on the ground's capacity to seep more of the wastewater, the event took place at least three times a year, and for us it was quite a sight to watch. One of the men descended right down into the drain to clear the muck after the easier part of the job had been finished with the help of buckets tied by ropes and lowered manually to draw the waste water, and eventually the big jars and tin containers were loaded on sturdy donkeys with desultory looks and taken only the devil knows where. Many Baghdad houses in those days had private wells, from which they drew water for washing. In the house we lived in, the well was so built as to serve as miqwe (mikve). This particular mikve was for women only and had to be operated by a woman, and as the name of the lady who managed the mikve was Lulu, everyone in the neighborhood knew her as Lulu um el-bigh (Lulu of the well), and the house her family owned as Beit Lulu um el-bigh. It was a fairly prosperous mikve business, what with the strict observance in those days. Lulu's mikve also was renowned for its cleanliness, and a great deal of work went into keeping and maintaining the establishment, which entailed among other things heating the water in winter on the days the mikve was open. While her husband and older sons were all gainfully employed, mostly in petty trading and money lending, Lulu was the real boss not only of the ritual bath but of the house as well, including the various details and activities related to subletting and subtenants like ourselves. Indeed I have always marveled at the fact that all the houses we lived in the 1920s and 1930s were named after the women of the households rather than those of their husbands. From Beit Lulu um el-bigh we moved on to Beit Dina, then to Beit Rahel —and it was only starting with the late 1930s that most of the houses in which we lived as subtenants were named after male owners.